Nigerian Rice accessories are all the side dishes that go well with all Nigerian rice dishes: Moi Moi, Fried Plantains, salads etc. 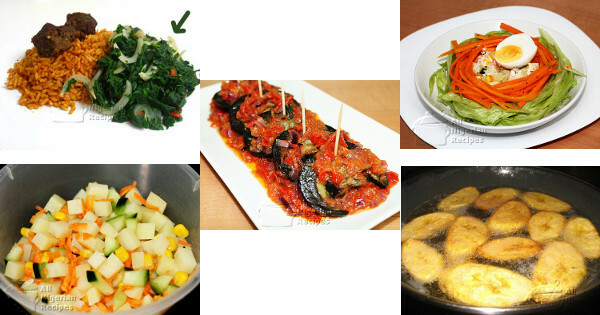 Feel free to serve these with other Nigerian staple foods. A different way to enjoy grilled chicken. Perfect hard boiled eggs make great companions to all Jollof Rice meals. See how to cook the perfect hard boiled eggs. Here's a perfect match for Jollof Rice, Coconut Rice, Rice & Beans, Fried Plantain and Nigerian Moi Moi. Peppered Snail is a common feature in Nigerian restaurants and a perfect match for Nigerian rice meals. Grilled chicken goes well with all Nigerian rice meals. "Rice and Salad, please" is also a popular request at events. Nigerian Salad and Jollof Rice is one food match made in food heaven. When Nigerian Salad is not available, the toned down coleslaw is the next choice of side dish for Jollof Rice dishes. Moi Moi is surely the side dish of choice at parties and other festivities where Jollof Rice is served. Jollof Rice makes Beans Porridge taste much better. A great combo for beans haters. This is the top side dish for when you are having any Jollof Rice recipe at home or eating out. It is very easy to peel, cut and fry plantain.